Sunday, November 17 1907 -- Lucky Baldwin came to California in the 1850s and took the smart route of providing services to gold miners rather than prospecting himself. He ran a hotel and stable in San Francisco. In payment for a debt he took shares in the Ophir Mine, essentially worthless at the time. In 1859, though, when the Comstock Lode was discovered, he became a wealthy man as Ophir operated a mine adjacent to that major find. 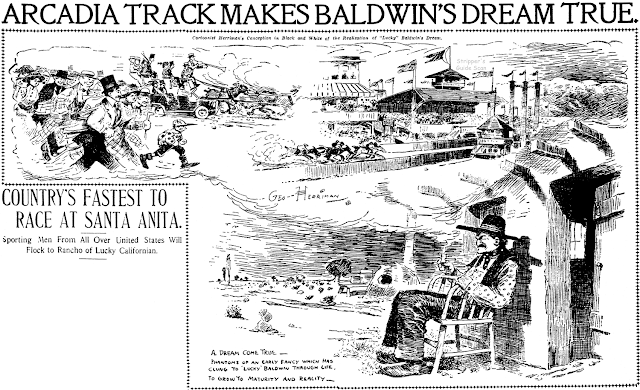 Baldwin used his wealth to indulge an interest in horse-racing, and was quite successful at it. In 1907, as seen in the cartoon, he opened Santa Anita Park, a racetrack with all the most modern amenities, including electric lit stables and a parking lot for automobiles. Lucky died in 1909 and eventually his racetrack was closed. However, the facility was later upgraded and re-opened in 1934 to become the Santa Anita Park we know today, one of the most famous tracks in the world. Paul West, who we've seen before with his features Father Goose and Dr. Birch's School, did this odd pair of features in 1900 for the New York World.These are our first features by him that show off his penchant for drawing anthropomorphic inanimate objects, a motif that he used often in non-series appearances in the comics pages. The Good-To-Eat Children came first, debuting on July 15. After a few installments he switched over temporarily to The Good-To-Eat Alphabet for a pair of episodes on August 12 and 19, then reprised the original series title until September 2. A bow to Cole Johnson who supplied both the samples and the correct running dates for these series. What a peculiar title! 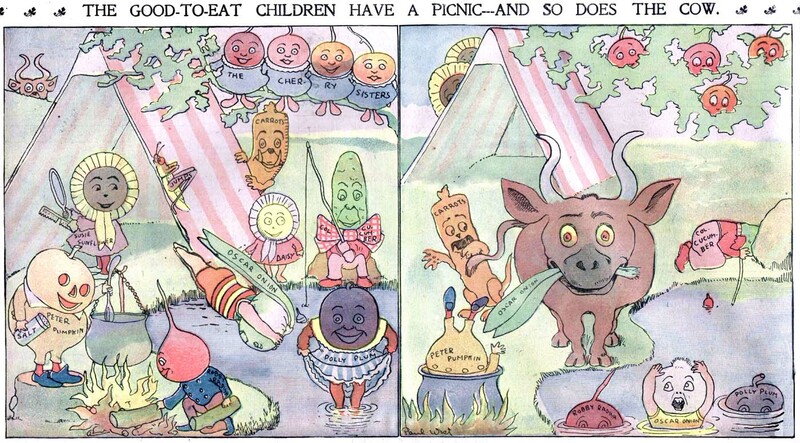 Advocating cannibalism in the Sunday funnies! 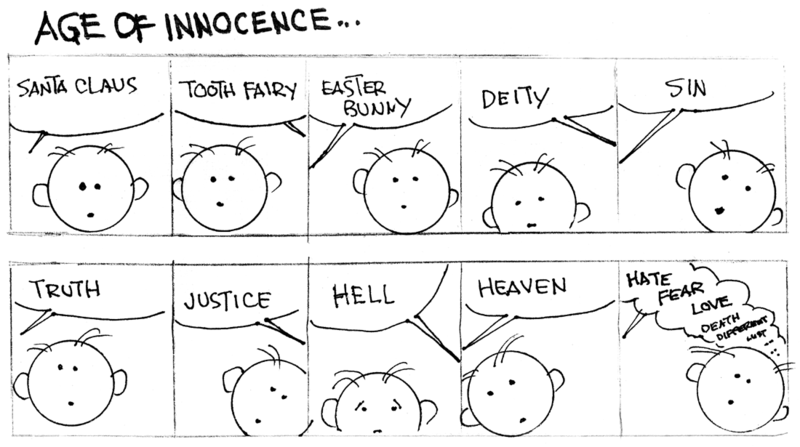 I agree with Paul K.--it's a spooky concept when the stars of your strip are all created to be eaten. Reminds me of the talking cow in "Hitchhiker's Guide to the Galaxy" that came to your restaurant table so you could choose your cut. Or Donald and the Nephews eating roast duck for dinner. Reminds me of Charley Tuna constantly trying to get Starkist's attention, seemingly unaware that such attention would result in his own demise. 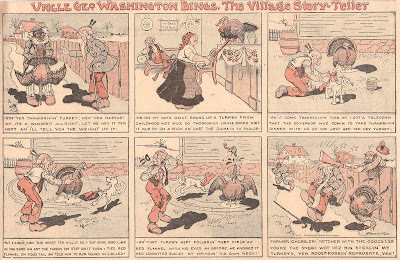 Although it certainly qualifies as an obscurity today, Uncle George Washington Bings was one of the headliner acts in the C.J. Hirt version of the McClure Sunday comic section for almost three and a half years. 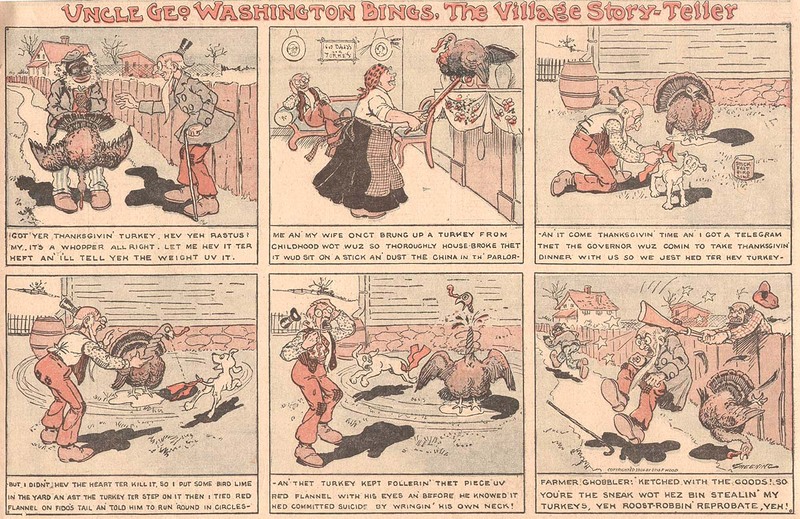 H.C. Greening produced this well-drawn and entertaining strip from September 25 1904 to January 12 1908. As with all the C.J. 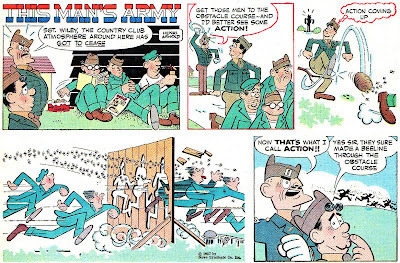 Hirt strips, in which the creators were rarely allowed to sign their work, Greening's name only appeared on the strip on a handful of occasions. The star of the show was that staple of small-town life, the old-timer who loved to tell tall tales to anyone who would listen. This sort of character was a regular in prose humor of the day, but curiously enough few of these leg-pullers were employed on the comics pages. 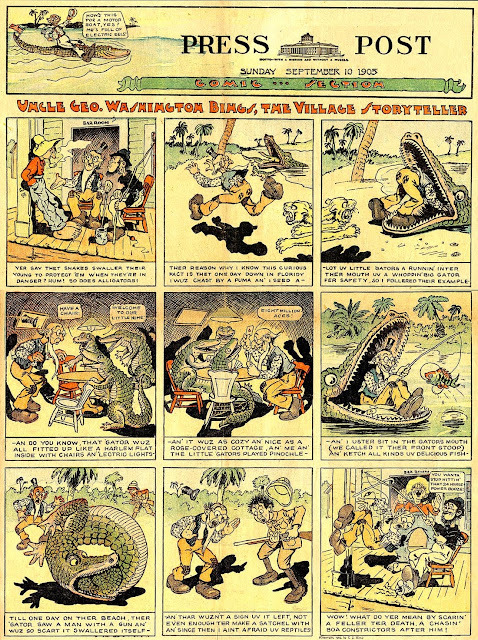 Although the series ended in 1908, McClure occasionally used a reprint of the strip to fill a hole in later sections, and Uncle George can be seen every once in a while popping up as late as 1912. Hello, Allan----Were the post-1908 UNCLE GEORGE WASHINGTON BINGS episodes reprints, or were they being used for the first time?-------Quite a difference from my old scanner (Humboldt Standard) and my new one (Columbus Press Post), eh?---Cole Johnson. The 1912 ones are definitely reprints, can't absolutely vouch for the occasional one that ran 1909-1911. What great artwork! Strong lines, nice use of shadow and light, great expressions. Feels more like 1950's Mad than early 1900's. Adapting popular novels to comic strip form has rarely been a recipe for success (see Book-of-the-Month for one example) and Best Seller Showcase ran true to form. As with previous attempts, newspaper editors seemed to take an initial interest, then after the first few adaptations the feature lost clients at a steady clip. Universal Press Syndicate, no stranger in the 70s to throwing features against the wall to see what might stick, distributed Best Seller Showcase with a considerable marketing push before its debut. Part of the supposed attraction was that the adaptations would only be eight weeks long, which of course did no favors to the book being adapted nor to the quality or depth of the strip. Notice above in the samples from The Chancellor Manuscript adaptation that artist Frank Bolle desperately tries to maximize his paltry space by sometimes shoehorning two scenes into one panel. 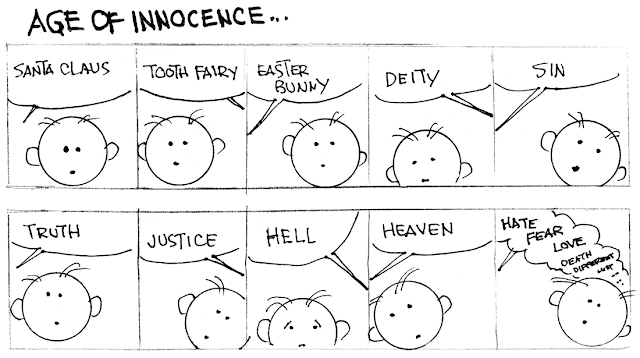 You've got to hand it to Frank for doing his best to show a cohesive narrative despite the restrictions. * The art on Storm Warning is unsigned, and I've heard it being credited to Winslow Mortimer or Jack Sparling, but it looks like Morrow to me. ** End date corrected as per Mark Taylor, based on run in Chicago Tribune. Some sources claim that this Sunday and daily strip ran until 1979, but I've never seen any further adaptations after All Things Bright and Beautiful, and that one seems to have possibly ended after just two weeks. Booksteve's Library has reprinted The Sword of Shannara storyline. Here's a link to the first post. Thanks for the listing. My memory was always that there was a Barbara Cartland story in there somewhere but I see not. Did she perhaps have a strip of her own? Or rather one adapting her books? I had completely forgotten the ILLUSIONS adaptation even though I remember clipping it out because I thought it was a particularly odd choice to adapt! If I still have it, though, I don't know where it would be. As I've pointed out elsewhere, part of the problem in developing a loyalty to this type of strip was the fact that one who enjoyed spy strips might dislike fantasy strips, etc. I'm in the Win Mortimer camp for artist on the Storm Warning adaptation. While not a great art identifier, it is undeniably Mortimer to my old eyes. Barbara Cartland Romances was a separate strip, which we'll cover one of these days as an obscurity. I don't think this helps any on the art question, but the Birmingham News ran the strip from 9/19/77 to 4/1/78 with a credit for Frank Bolle and Elliot Caplin, so Caplin wasn't particularly ghostly on this one. Interesting! I didn't think the official byline included Caplin. As a boy who grew up wanting to be the next Alex Raymond (hasn't happened yet), Gray Morrow's adaptation of "The Sword of Shannara" was one of the most thrilling things I'd seen in newspapers for a LONG time. As I recall, we had a blizzard that year and I missed several installments, but wow ... great stuff. I'm sure I still have those strips, yellowing away in a photo album somewhere. "All Things Bright and Beautiful" with art by Frank Bolle dated 6-Aug-1978, 13-Aug-1978 and 20-Aug-1978. Uh-oh, that means the end date on Illusions is incorrect. Can you tell me what paper ran your samples? Does the August 20 episode end the adaptation? Yeah, I think there is an error with the "Illusions" dates. Those three "All Things Bright and Beautiful" came from the Lake County News Herald. Unfortunately I do not have the surrounding Sundays. August 20th does not end the adaption. "Illusions" concluded on Sunday July 30th 1978 (confirmed via the Chicago Tribune). Today we have one of the most beautifully drawn series you'll ever see, and not only is it incredibly obscure, but it is mysterious on several counts. 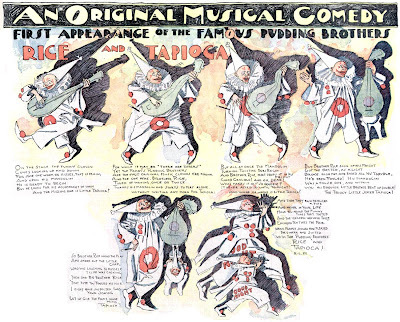 Rice and Tapioca, the Famous Pudding Brothers ran in the Philadelphia Inquirer from April 24 to July 3 1898. It was one of several features the Inky ran that were 'syndicated'. 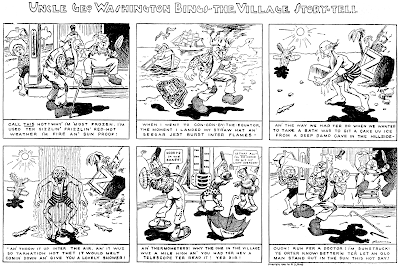 I put the quotes around that term because there's no evidence that these strips (the two others are The Country School and The Barnyard Club) were sold to any papers other than the Inky. 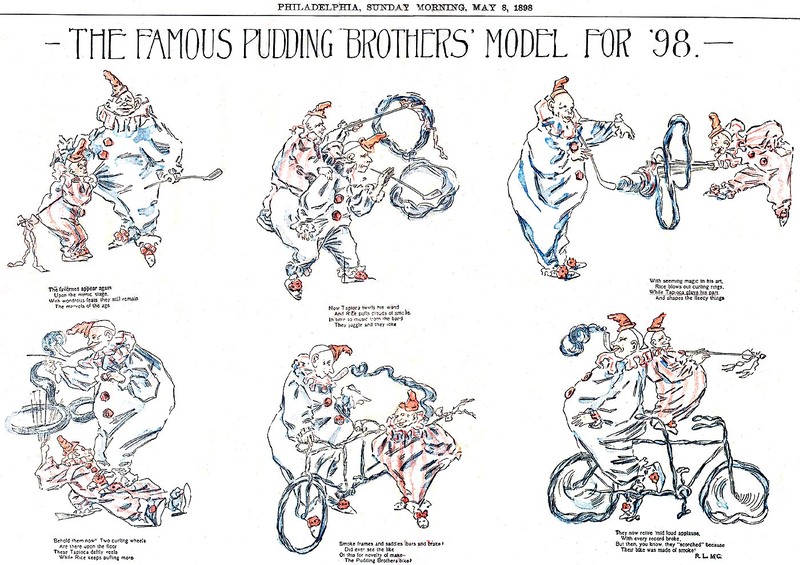 Pudding Brothers is different than the other two -- the others might have been sold directly to the Inquirer by Outcault, whereas this one includes a copyright by the New York Herald on some episodes. Does this represent the very earliest syndication attempt? The Herald did not run this feature (or have a proper Sunday comic section at all until 1900)*, so if it was producing it solely for the Inquirer in my opinion it's not a case of syndication unless we're prepared to take serious liberties with the term.Cole Johnson tells me that several episodes refer directly to Philadelphia, so it would seem the series was produced with the Inky in mind. 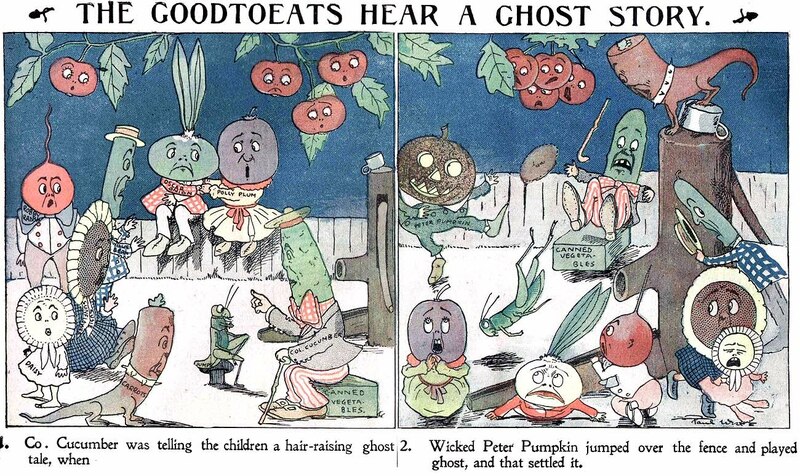 The other part of the mystery, just as intriguing, is the question of who drew these gorgeous strips. 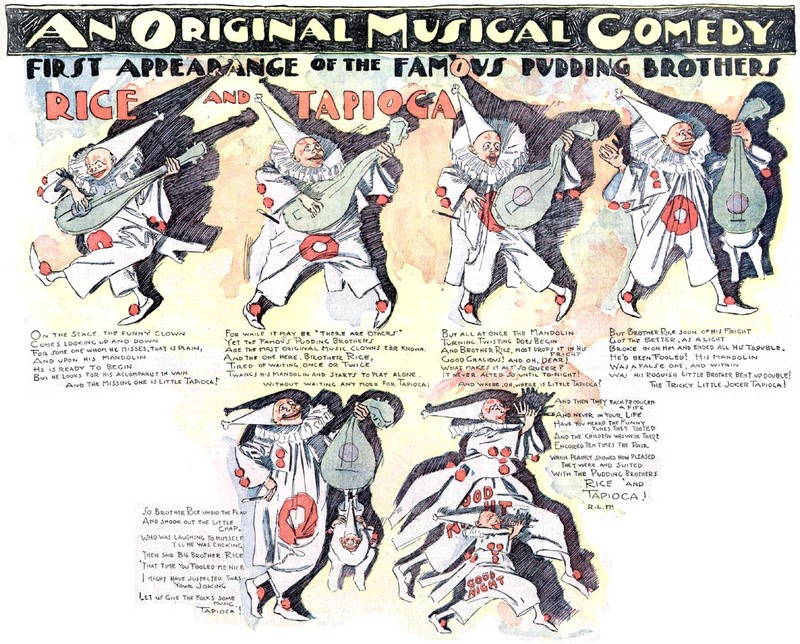 The verses are credited to Roy L. McCardell, whose prose and poetry were fixtures at Puck and various New York newspapers starting in the 1890s, but the art is unsigned. Who would take such care on the drawing of a feature yet not sign it? The most likely answer, it seems to me, is that some cartoonist from another paper was moonlighting (Archie Gunn maybe?). 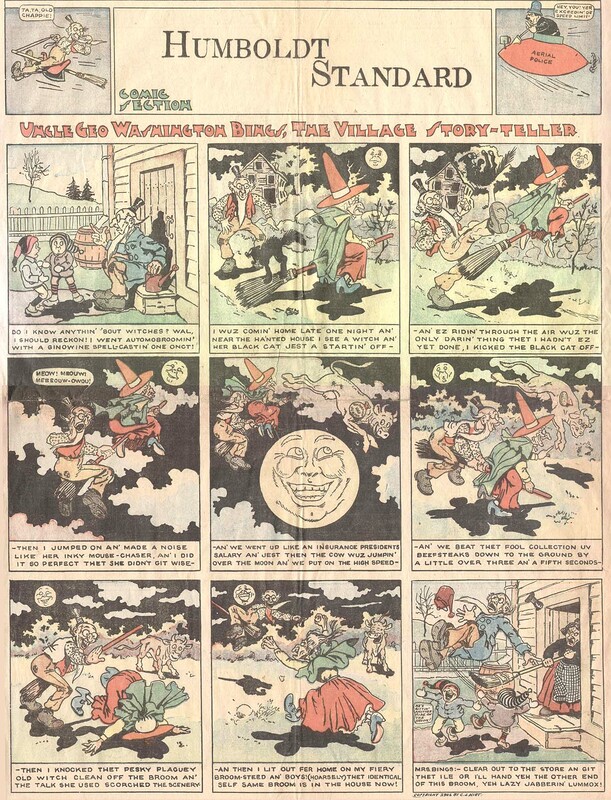 Or maybe it was one of McCardell's buddies at Puck who felt newspaper cartooning was beneath him. Or maybe it's Charles De Yongh, the only cartoonist I know of who did a series for the Herald in 1898. What do you think? Much thanks to Cole Johnson who supplied these lovely samples of a great strip. * Taking a second look at Cole's notes on this feature, I think he is saying that the top sample DID appear in the Herald, on January 10 1897, over a year before the Inquirer run. I didn't index the Herald before 1898 (there seemed no reason to) so I can't say if they ran just the single example or the whole series. EDIT: I have now indexed the New York Herald for 1897, and this series DID in fact run there over a year before the Philadelphia Inquirer printed it. In that appearance the first few installments are uncredited (but I'm getting pretty firm about the first installment only being the work of Archie Gunn). Most of the series, though, is signed and credited to someone whose signature looks to be L.M. Pillet. 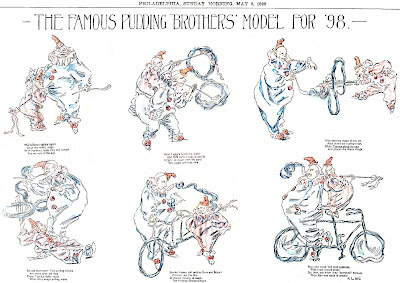 The pudding brothers were an internationally known vaudeville clown and donkey act performed by the "Silent" comedians Burke and Andrus (sometimes Burke, Frisco and Andrus)in the 1890's. Burke was Billy Burke, father of actress Billie Burke. Proof, then, that the web doesn't offer absolutely everything. A search on Pudding Brothers comes up dry. I guess Vaudeville REALLY IS dead! A search for William Burke brings up a few slight references. This page mentions him as a singing clown with Barnum & Bailey in the 1880's. In observance of Memorial Day, let's take a look at a military-themed obscurity. 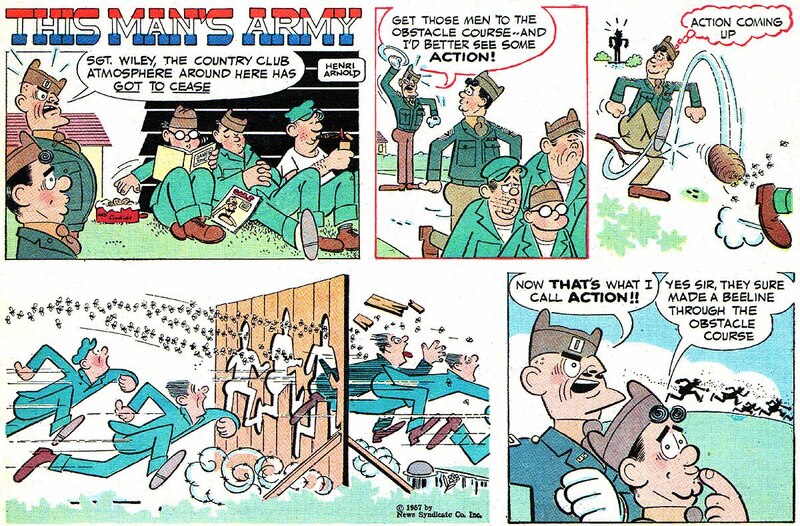 This Man's Army was one of those filler Sunday features that the New York Daily News used in their comic section. I know of it running on at least seven occasions, five times in 1957 and twice in 1959, but it probably ran more than that. The strip was created by Henri Arnold, who is best known for his Jumble puzzle cartoons and for his fourteen year stint on that Daily News institution, Ching Chow, and for its more politically correct replacement, Meet Mr. Lucky. EDIT 2/15/2019: Michael Vassallo reports running dates of 3/24/1957 to 4/24/1966. He says that the strip did not run for about four years before that final date. I have one for Sept 1, 1957. Make that at least six in 1957 then, that's not one of the dates I had. I suspect this one still ran in the early 60s because I've seen original art for vertical format strips, which the NYDN seems to have switched to for its fillers in those years. In case you get this before I write snail mail or see you... the Queen and I made a trip to Orlando Saturday. We called to see if we could take you out to a late breakfast or early lunch, but there was no answer.